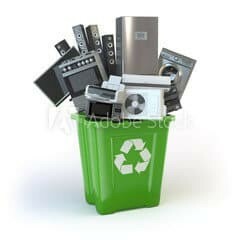 SBC Recycle sponsor events where citizens can drop off waste electronic devices or equipment that are usually prohibited from disposal at municipal waste facilities by the Covered Device Recycling Act, Act 108 of 2010. These programs ensure that the waste electronics are recycled or properly disposed such that valuable materials are recovered and hazardous materials are prevented from creating environmental and public health hazards. Approximately 50 percent of the waste that Americans generate every day is recyclable through traditional recycling means. On top of the paper, glass, and metal an additional 20 percent of our waste is recyclable through specialty recycling programs such is the ones we host at local businesses in the community. • Free: No cost to either the company, property management, or to the employees. • Convenient: Employees and tenants don’t have to make a special trip after hours or on a weekend to come to us or find another recycling facility to recycle their electronics. • Environmentally Conscious: We keep hazardous electronics out of the landfill by recycling electronics that belong to employees or tenants. Our friendly and trained staff will be ready to direct you through the event in an organized manner, and answer any questions you have. We plan to have all of the man power needed to unload your vehicle of your electronics for proper recycling, so there is usually no need to exit the vehicle. Simply tell our staff what you have to drop off, and we will take care of the rest. Drive up and follow the signs—you can just stay in your vehicle, and we’ll unload for you. Make sure you’ve reviewed the items accepted for the specific event you’re attending– what is accepted depend on the host or sponsor. Just like at our warehouse, some items require a fee and some are free. Cash or check are accepted. Then, we bring all of the items back to our warehouse for proper recycling and data destruction. SBC Recycle offers professional data destruction, including shredding and wiping services for all memory containing devices. We also offer Certified Destruction Services, which means that our destruction procedures meet or exceed all Federal, State and Global Requirements (Sarbanes Oxley, GLB, FACTA and HIPAA). We utilize proprietary tools to wipe hard drive, record serial numbers and create auditable certificates of destruction. 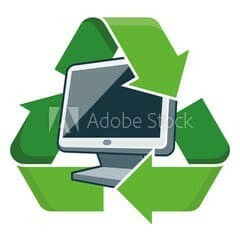 Reusing surplus computers and electronics is good for the environment and can earn extra income for your company. Before this can occur, computers and other devices that contain sensitive data must be handled properly to protect your information. SBC Recycle’s collection events and fundraisers are a great opportunity for schools to recycle their own ewaste and also offer the opportunity to students and parents to participate. Donations can be accepted at these events that will benefit the school and provide funds for certain events or projects. We provide certified electronic recycling for schools. In most cases, we recycle school e-waste for free and even pay you for certain material such as laptops and PCs. As a certified recycler with a proven track record, SBC Recycle provides proper electronics recycling services to K-12 and Universities throughout the greater Portland Metro Area. We will also be happy to provide a written proposal if you need it. Simply contact us to get the conversation started. Are You Interested In Hosting a Collection Event? SBC Recycle partners with local charitable and school organizations to provide you with convenient locations to recycle all of your used electronic devices. If you represent a non-profit group or would like to see a collection event held in your community, please email for more information. Your employees or tenants can bring in e-waste the day of the event, or for several days before (if you have a location to store the material), and we collect it, haul it away, and recycle it for free. We can park our truck onsite for a specified time period (typically 1-2 hours), and employees or tenants can bring material directly to our truck. We can even assist (subject to prior scheduling) with our complimentary ‘suite’-side service, coming to individual offices within a building and picking up directly from each participating company.